• Glaucoma is a leading cause of blindness and is managed medically and surgically. 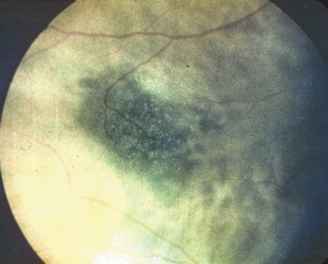 • Choroidal melanoma is the most common intraocular malignancy. • Posterior vitreous detachment is a common cause of vitreous floaters but may present similar to retinal detachment. • Age-related maculopathy represents a significant cause of central vision loss in older adults. • Some patients with macular degeneration may benefit from advances in therapeutic laser treatments. • Vitamin supplements have been shown to be beneficial for some patients with macular degeneration. • Routine funduscopy should be performed to evaluate for hypertensive retinopathy and diabetic retinopathy. • Diabetic retinopathy is the most common cause of blindness in Americans age 20 to 74. • Giant cell arteritis generally occurs in patients 55 and older, with headache, scalp tenderness, jaw claudication, malaise, fatigue, and amaurosis fugax. • Carotid artery disease is an important cause of transient ischemic attacks; 50% of patients with TIA involving carotid artery disease have a major stroke within 1 month of first attack. • About 75% of women and 34% of men with optic neuritis will develop multiple sclerosis within 15 years. Retinal diseases account for 10% to 15% of blindness. Common retinal diseases include macular degeneration, diabetic retinopathy, retinal detachment, and retinal vascular disease. Sudden loss of vision can have various causes; four common causes are retinal detachment, temporal arteritis, ischemic optic neuropathy, and optic neuritis (Table 41-6). The vitreous gel degenerates during middle age and forms microscopic strands within the eye. An increase in previous floaters, acute flashing lights, or the appearance of a veil or curtain over a patient's vision may signify a retinal detachment. Posterior vitreous detachment is a common cause of vitreous floaters. The sudden onset of vitreous floaters can be alarming for the patient. Generally, they are simply the result of the normal aging process. Vitreous floaters may interfere with clear vision, particularly reading. Although generally benign, posterior vitreous detachments can create retinal hemorrhages and are associated with retinal tears and detachments. If no ophthalmologist available, begin oral glycerin (1 mL/kg), intramuscular acetazolamide (500 mg), and topical pilocarpine (1%-4%) every 15 min. Enlarged and painful temporal artery Increased erythrocyte sedimentation rate is key to diagnosis. Definitive treatment is high doses of systemic corticosteroids. Involvement of other eye in relatively short time; therefore, immediate referral is imperative. Figure 41-30 Choroidal melanoma. Increased pigmentation involves the choroid, with characteristic lipofuscin overlying the lesion, which is slightly elevated with bowing of the overlying vessels. This melanoma was locally treated. 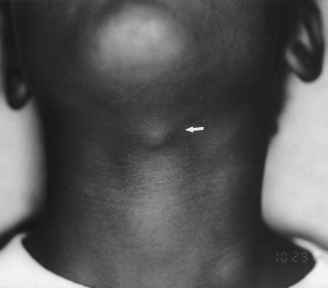 involve radioactive plaques, and enucleation is performed less frequently. When a small, melanotic lesion is detected, observation is indicated in older adults with slow-growing lesions. 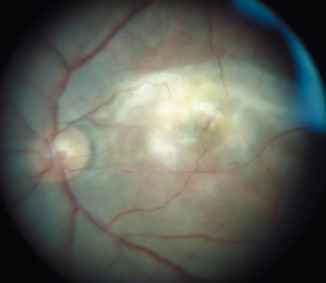 Figure 41-31 Age-related maculopathy in 73 year-old woman who demonstrated evidence of geographic atrophy with her macular degeneration. patients. Macular degeneration begins with nonexudative changes (Fig. 41-31). However, many people with macular degeneration have an abnormal vascularization that is not always amenable to laser therapy (Fig. 41-32). The condition occurs in the other eye within 1 year in 10% of cases. Another form of macular degeneration is exudative macular degeneration, which accounts for 10% of cases. Figure 41-32 Age-related maculopathy with choroidal neovascularization. Abnormal blood vessels have formed in the area of macular degeneration and require further studies to determine whether laser treatment is indicated. tissue may form, often leading to abnormal growth of new blood vessels (neovascularization). These new vessels are particularly fragile, and leakage and bleeding may occur. If macular degeneration involves both eyes, near activities become difficult. If an individual loses central vision related to macular degeneration, generally the peripheral vision is unaffected. An ophthalmologist can confirm the diagnosis of macular degeneration; assessment includes color vision testing, ophthalmoscopy, and fluorescein angiography, when indicated. Examination reveals an accumulation of membranous debris on the posterior aspect of the retinal pigment epithelium, presence of drusen, and atrophy of the retinal pigment epithelium. In addition, there may be detachment of the retinal pigment epithelium and choroidal neovascularization. There is no cure for patients with ARMD. Ophthalmic laser surgery may be beneficial in reducing the spread of the exudative macular degeneration, but it is successful only in the early stages. Laser therapy and anti-VEGF (vascular endothe-lial growth factor) medications have been helpful in treating membranes and neovascularization. Advanced cases of macular degeneration have been treated with macular translocation with some success. At present, use of multivitamins with beta-carotene and vitamin E may delay progression for many patients with ARMD. However, beta-carotene supplements in smokers have been associated with an increase in lung cancer. Vitamin supplements have no impact on cataract formation. Patients with intermediate age-related macular degeneration had a 25% reduction in the progression of ARMD with the following vitamin and mineral supplements: vitamin C (500 mg), vitamin E (400 IU), beta-carotene (15 mg [25,000 IU]), zinc oxide (80 mg), and cupric oxide (2 mg) (AREDS Research Group, 2001) (SOR: A). Management options for macular degeneration include observation, antioxidant vitamin and mineral supplements, intravitreal injection of anti-VEGF agents, PDT, and laser photocoagulation surgery (AAO Preferred Practice Patterns, 2008) (SOR: A). Routine ophthalmoscopy in hypertensive patients affords the physician a direct view of the arterioles and helps assess the long-term duration and severity of the hypertension as well as evidence of accelerated or malignant hypertension. In the vascular system, arterioles serve as the resistance vessels, and the overall cross section of the arteriolar bed determines peripheral resistance. With the fundus examination, the physician can directly observe the degree of spasm in arterioles and the effects of long-term hypertension on the arteriolar wall. Severe hypertensive retinopathy can lead to profound vision loss, although usually the patient is completely asymptomatic. The normal arteriolar wall is transparent, and the visible image is of the blood column as it passes through the arte-riolar lumen. An additional anatomic consideration is that at the point of crossing of the arteriole and venule, the vasculature shares a common adventitial layer. Therefore, when arte-riolar thickening occurs, the venule is compressed, resulting in arteriolar-venous (A-V) nicking. It is practical to divide the changes in the fundus seen in hypertension into two scales, a hypertensive scale and an arteriole-sclerotic scale (see online text, Hypertensive Retinopathy Grading). Diabetic retinopathy is the most common cause of blindness in Americans 20 to 74 years old. Diabetic patients are at 25 times greater risk of becoming blind from diabetic reti-nopathy than nondiabetic persons of becoming blind from all other causes. Diabetic retinopathy is more common in women, but men appear to develop a more complicated and severe proliferative retinopathy. Findings have shown that in type 1 diabetes mellitus, it is unusual to detect diabetic reti-nopathy before 5 years after onset of disease. After 15 years from diagnosis, most patients with type 1 diabetes have some diabetic retinopathy, with incidence of proliferative disease greater than 40%. In type 2 diabetes, with onset after age 30, diabetic retinopathy is often detectable at the initial diagnosis. Diabetic patients requiring insulin have a higher incidence of diabetic retinopathy and proliferative disease. The precise pathogenesis of diabetic retinopathy remains unclear, but the target tissue is the retinal capillary. Localized ischemia has been shown to increase levels of vascular endothelial growth factor (VEGF) and result in a corresponding area of vascular proliferation. The vascular complications evolve through states defined by ophthalmoscopic findings. The first stage is called nonproliferative or "background" retinopathy (Fig. 41-33). Capillaries leak and later become occluded. 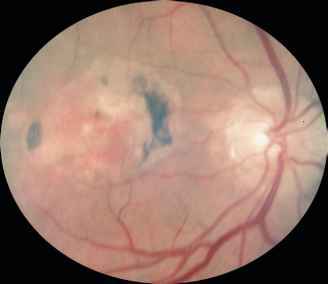 The retinal findings include aneurysms, hard exudates, intraretinal hemorrhages, and macular edema. In the nonproliferative stage, patients will only experience visual loss if there is macular involvement. Visual loss from macular edema is present in 5% to 20% of diabetic patients, depending on the type and duration of disease. With progression, patients will develop preproliferative diabetic reti-nopathy. This stage frequently progresses to proliferative diabetic retinopathy. The most readily recognized abnormality of preproliferative retinopathy is the cotton-wool spot, a white opacity with feathery edges indicative of localized retinal infarct of the nerve fiber layer. Proliferative diabetic retinopathy (PDR) is responsible for most serious vision loss in patient with diabetes. As a result of continued retinal ischemia, new blood vessels form in the area of the optic disc or elsewhere on the retinal surface (Fig. 41-34). Without laser photocoagulation, these vessels typically progress to retinal detachment and form vascular-ization within the vitreous cavity. Neovascularization results in vitreous hemorrhage and retinal traction. Once fibrous proliferation has detached the retina, surgical repair can be challenging. Prophylactic laser photocoagulation is the best way to avoid this complication for diabetic patients with proliferative diabetic retinopathy. Screening eye examinations for patients with type 2 diabetes reduce the chance of vision loss (FPIN, 2004) (SOR A, 1). Type 1 diabetic patients should have their first eye examination 5 years after onset. Type 2 diabetic patients should have their first eye examination at diagnosis.